Borders are somewhat random markers. Most of them probably began fluid and malleable, just scratches in the dirt, then piles of rocks and finally impenetrable barriers of steel and cement, reminders of past wars, negotiations and landgrabs. In California, the iron curtain rises above an otherwise pristine desert landscape, a jarring image against unrestrained beauty. Only a human could make such a perfectly straight line through the natural undulations of God’s wild creation. Borders are the offspring of politicians and cartographers. U2 sings, “Where you live should not decide whether you live or whether you die.” If I lived 100 feet to the south of where I stood when I took these pictures…. I can’t even wrap my head around that. 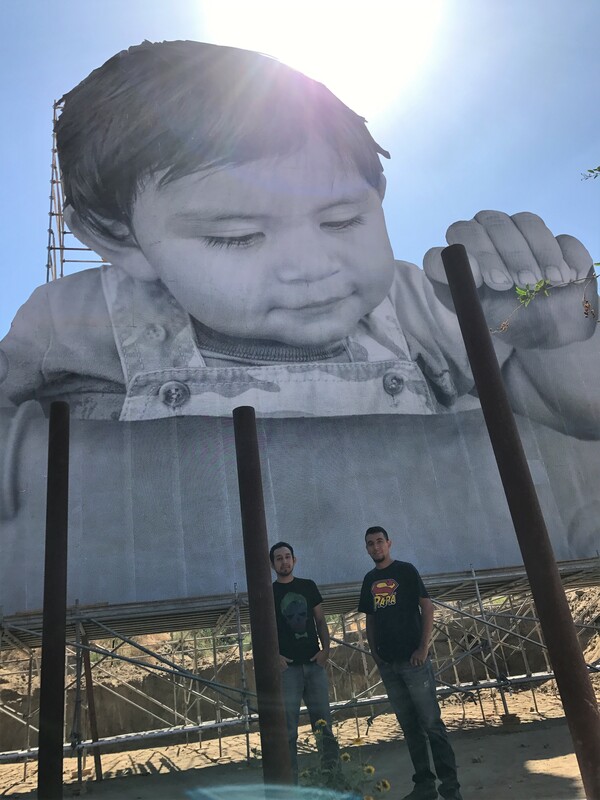 My son and I made the pilgrimage to the border town of Tecaté. It was the morning of U2’s San Diego show (September 22, 2017), a concert that I had promised him three months earlier as part of his high school graduation present. A gorgeous drive on its own, it took about an hour from downtown where we were staying. 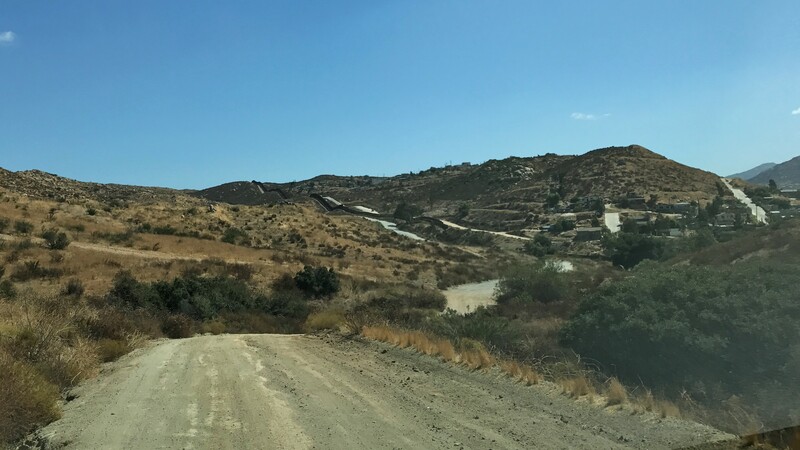 As we meandered through the rolling desert hills, sunroof open to let in the smells of an arid wilderness, we passed a security check point just before trading a paved road for a dirt one, an indiscreet route that wound between old adobe homes and tattered fences. 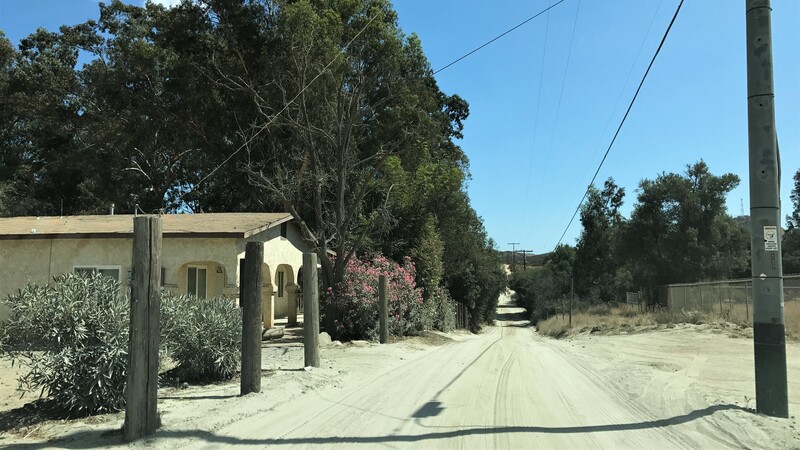 Our GPS pointed us in the right direction, but we had to make a guess a time or two while figuring out which rain-rutted street with no name we should take next. We kicked up plenty of dirt as we passed by one border patrol, then another. We just acted like we knew where we were going. I guess a couple of white guys in a VW Passat didn’t look too suspicious. “We must be getting close,” we kept saying to each other. “Is that it?” No. “How about that?” Not yet. And then we rounded a corner. We gasped. “OH!” It couldn’t have caught us more off guard. 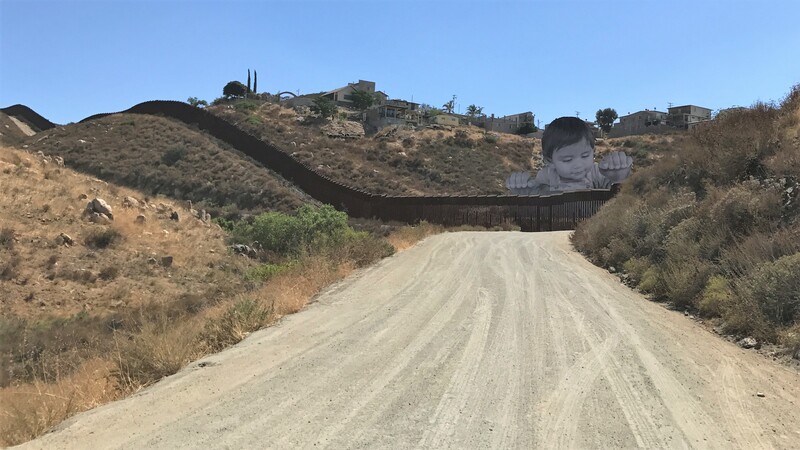 JR, the elusive French renegade artist who created this installation, found his inspiration in the village that sits on a hill immediately adjacent to the wall. 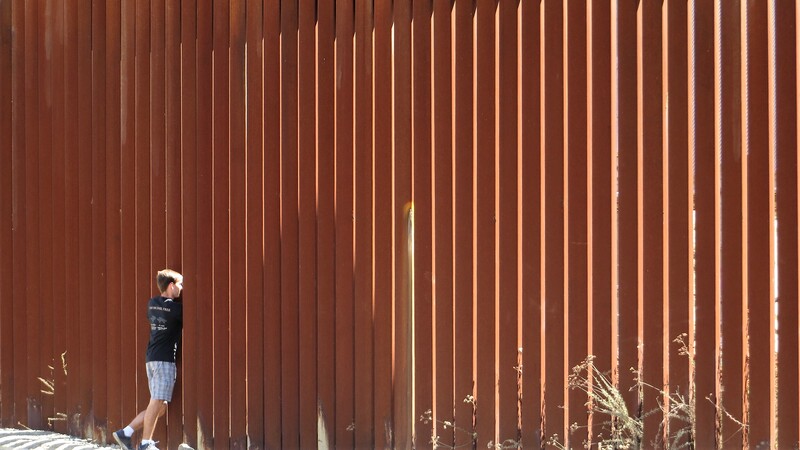 Kikito, a one-year-old boy, gazes down over the fence as if peering out of his crib, a perspective that’s only gained on the American side of the border. 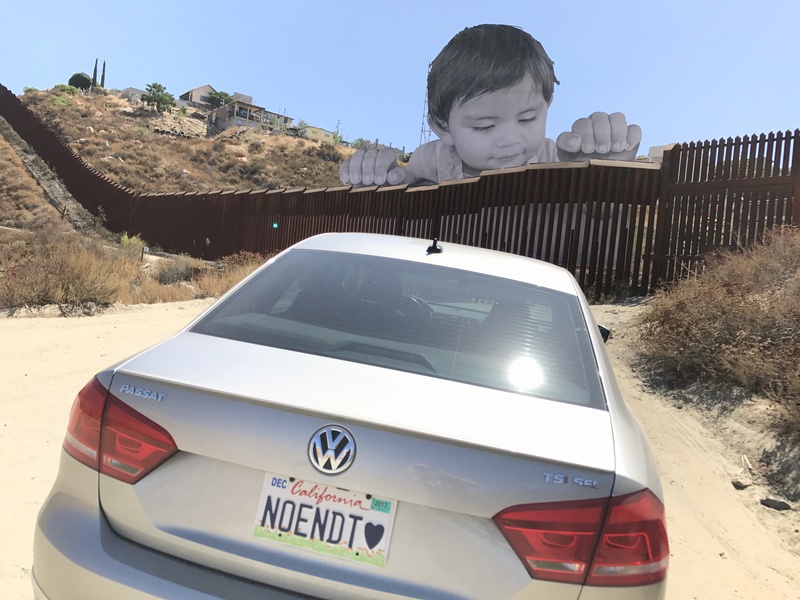 From the artist’s website: “Kikito and his family cannot cross the border to see the artwork from the ideal vantage point.” That’s a luxury that white guys in a VW Passat have. Soon after my son and I arrived, we started noticing some activity on the south side of the wall. We could hear the creak of a swing set, kids laughing and playing. Then a couple of Mexican nationals walked up. Two young adult males stared through the slats at two Neufelds. I managed to make use of the few Spanish phrases I knew. “Como se llama?” Julias and Isaiah were their names. “Me llama es Timoteo.” We smiled and made a few more gestures while they took pictures of the towering baby who was watching over them. Then another family came. And another. Curious onlookers, documenting this monster that had invaded their neighborhood. Then came the moment I had come for but couldn’t predict. 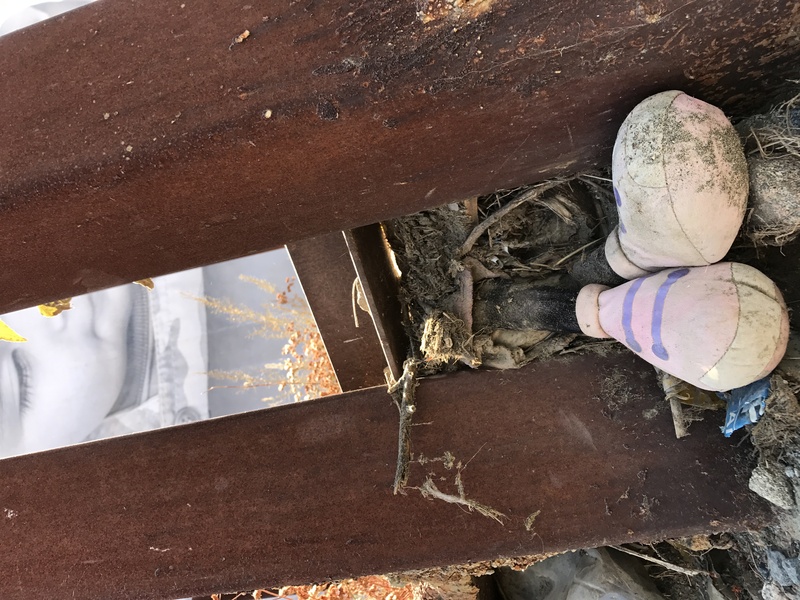 A young mother and father with three small children wandered down to the site on the Mexican side. We waved and smiled as I pressed up against the rusty metal that separated us. Time and geography collapsed into nothing as the man approached. “El photo?” he asked. Si. He handed me his phone and motioned for me to walk backwards, away from the fence. They wanted a picture from the American side, with them posing beneath, peering through the bars. They wanted to see what I see, but they needed my help. So much irony in that instant. The encounter seemed like something straight out of Bradbury’s Chronicles, the chance rendezvous between a native Martian and the Earthman that had decimated his planet. If only I could see what they see, to look at the world through another’s eyes. This was no longer an installation. This was performance art. We were part of it, entwined and infused in the meaning of the medium. 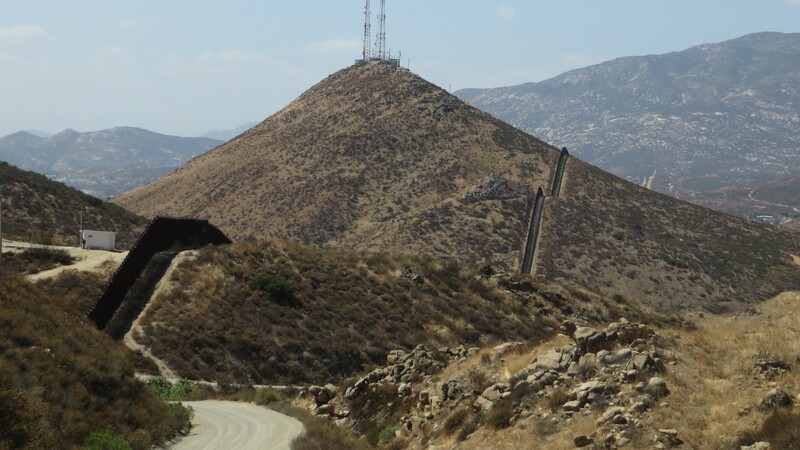 Also while we were there, several people came up and joined us on the American side of the border. 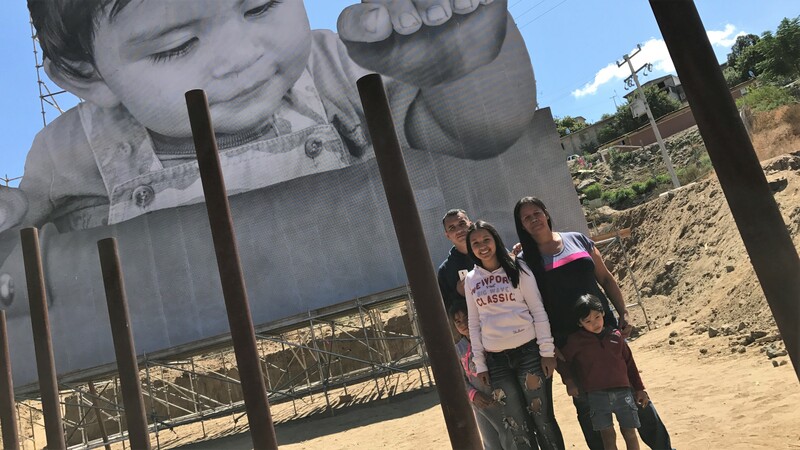 A young Latina brought her three daughters; I took their picture as they stood in front of the wall-baby. An older Caucasian couple came next, the man with camera in hand, truly inspired and moved. Another wayfarer arrived. Interest was high. Then a couple rolled up in one of those heavy-duty four-wheeled utility vehicles – a golf cart on steroids. Presumably a local, the man ridiculed, “Aww, look at the little baby. I bet he wants to come to America. Poor baby. Maybe he should ask his parents to bring him here legally.” The heckling was intentional and continued for a few minutes. Five of us on the American side. Another family on the Mexican side. The space between a cacophony of indignation and righteous anger. In the Old Testament, the nation of Israel was chastised repeatedly for sins of arrogance and inhospitality. From the start, God’s people were warned that one of the key tenets of their newfound peoplehood would be to show compassion to others. Why? Because they were once the people in need of compassion. In the Hebrew book of law, the book that provides foundational instructions for God’s people, we hear, “When a foreigner resides among you in your land, do not mistreat them. The foreigner residing among you must be treated as your native-born. Love them as yourself, for you were foreigners in Egypt” (Leviticus 19:33-34). And again, “Cursed is anyone who withholds justice from the foreigner, the fatherless or the widow” (Deuteronomy 27:19). Later, the prophets rebuked the wayward Israelites, “This is what the Lord Almighty said: ‘Administer true justice; show mercy and compassion to one another. Do not oppress the widow or the fatherless, the foreigner or the poor. Do not plot evil against each other’” (Zechariah 7:9-10). Sadly, the message that is lost on the American civil religious experience is that God has always been a welcoming, compassionate and hospitable God. In the New Testament, Jesus consistently calls people back to the foundations of their faith. I have come to proclaim good news to the poor, freedom for the prisoner, recovery of sight for the blind, freedom for the oppressed (Luke 4:18). I was hungry and you fed me, thirsty and you gave me drink, a stranger and you welcomed me (Matthew 25:35). Love your neighbor, not if…. Love your neighbor, not when.… Just love your neighbor (Mark 12:31). A religious leader asked, “Who is my neighbor?” Jesus replied not by telling the story of a good Jew, but by giving the example of a Samaritan – a despised half breed, a dark-skinned foreigner who wasn’t even considered a member of the faith. It’s a great lesson of God’s kingdom: the messenger of grace and salvation will likely be someone you least expect and even disagree with. I have no doubt – none – that we are missing a divine encounter by alienating, deriding and discounting our Mexican brothers and sisters to the south. God has blessed the people of America, but God has also blessed the people of Mexico. We continue to lie beaten and broken on our own road of religiosity, completely unaware that our Samaritans are nearby. The blessing missed is our loss. At least I was able to experience a tiny fraction of that blessing as I stretched my hand through the slats of a steel barricade, returning the phone that had been entrusted to me. “Go and do likewise” -Jesus.